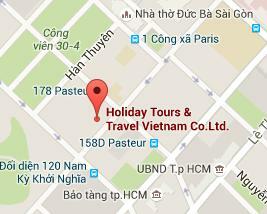 07:45 Pick up at your hotel in Ha Noi by shuttle bus (on request). 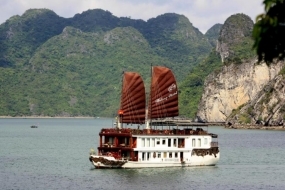 After that we leave Hanoi for a 3.5 hour to reach Halong Bay. 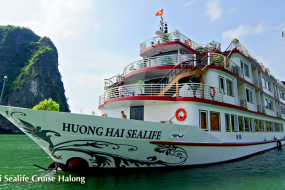 12:00 At Tuan Chau International Marina, a tender boat will take you to our Halong Phoenix Cruiser. A refreshing welcome drink is served and you can check into your cabin. 14:30 we have time to gear up for one hour kayaking around Luon cave area .Our guide will show you some basic safety guidelines and techniques to paddle before helping you to sit on our brand new sit-on-top kayaks.After that our boat will help you visit the Titop Island one hour for swimming, sun-bathing or getting a panoramic view on island peak. 07:45 Enjoy the morning view of the beautiful landscape with a cup of coffee or tea. Have breakfast in the fresh air. 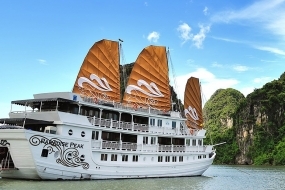 08:30 Leave the Halong Phoenix Cruiser on a smaller boat and cruise to the Head islet and Drum Area, boat stop at Parachute cave where you will do kayaking and swimming and explore the pure water there. Optional: In case the Parachute cave area gets strong winds and big waves ( in bad weather condition), we will take you to Drum Cave, Fairy Lake or Cua Van Village to do the kayaking. 12:00 A fresh seafood lunch is served on the support boat. 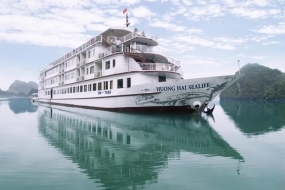 13:15 Boat will take you to the Pearl farm where you can learn the process of cultured pearls. 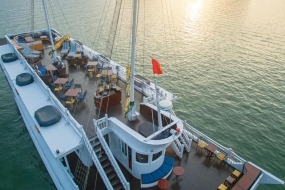 16:30 You will be back to cruise. 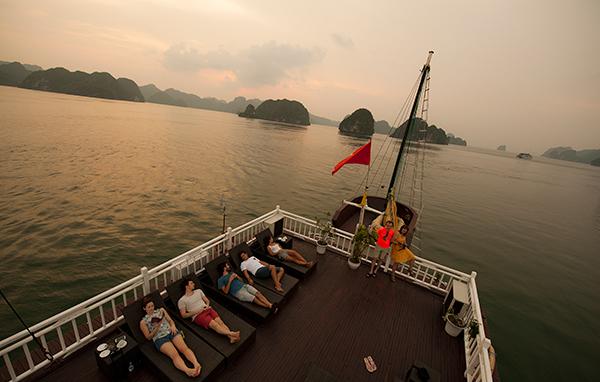 Halong Phoenix cruiser is waiting for you at Titop island to welcome you on board. 07:45 Enjoy the morning view of the beautiful landscape with a cup of coffee or tea. 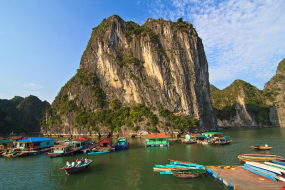 Have breakfast in the fresh air..
08:00 You will visit the impressive Cave of Halong Bay – Surprising Cave (Sửng Sốt) with your tour guide, a truly awesome and amazing cave to experience.